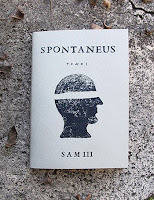 'Spontaneus 1' is a new black and white zine from Spanish street artist Sam3. A compilation of his drawings, made in an impulsive way where the important fact is not the final subject but the line journey as all are made without lifting the pencil from the paper and can be re-recreated again by the eye. The zine is 50 pages, printed on recycled paper and 15x10.5cm in size. Available from Sam3 website for 5EURO.